More awesomeness, and this time, only a short drive away! 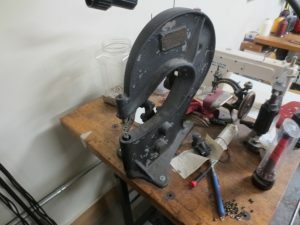 This weekend, it was time to visit another local maker space, LowellMakes, in Lowell, Massachusetts. They’ve got a really nicely decked out space (with some help from the Commonwealth), and all in all, it looks very professional. 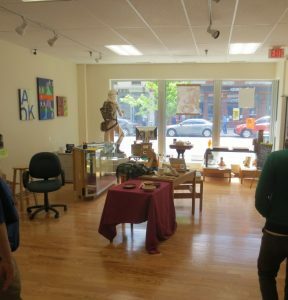 LowellMakes looks like a bit of a tweaked hybrid between a pure maker space and co-working space. It is in the center of town, was easy to get to and to park. 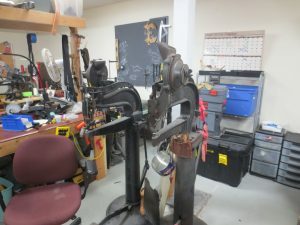 Every maker space has the usual suspects; a few Bridgeports/milling machines, lathes (small, medium, and large), 3D printers (more 3D printers than 2D printers, of course), wood working tools, an electronics area, and laser cutters, but every one has a few special extras that make these visits so neat and cool. 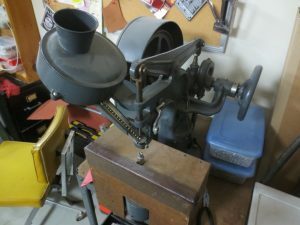 The eclectic list for LowellMakes, if you are curious, is here. 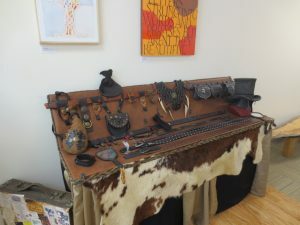 First, about the space – LowellMakes is lucky in that they have two floors; one that has more of a co-working/social/classroom/gallery area, and a downstairs that has some of their heavier equipment. This is good, because it can isolate the noise and cruft that can sometimes accrue in even the best of spaces. LowellMakes is completely run by dedicated volunteers. So, what makes this place a bit different? 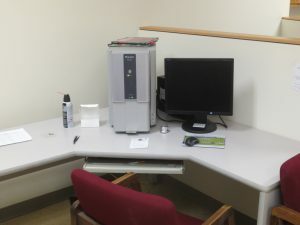 At LowellMakes, they have a very modern electron microscope, for one! 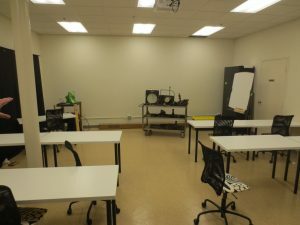 A new classroom (and, look closely in the front- a bunch of old gages from a Lowell mill building – Lowell used to be a serious industrial powerhouse). And, as noted above, nice gallery area on their first floor, which opens to the street. 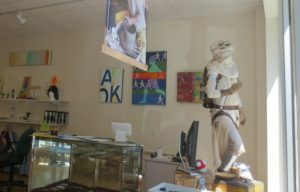 Many spaces aren’t so lucky to have this sort of storefront, which can show people as they pass by what can be created. The view from the front almost looks like any other store, except, of course, it’s a bit more maker themed, with, of course, the requisite sci-fi bits, models, costumes, and trinkets. 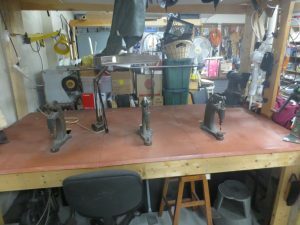 The downstairs has a few areas; a main room/electronics area, a nicely outfitted woodworking shop (with dust collection, a SawStop table saw (for safety, of course)), a new metalworking shop, and a leather working area. 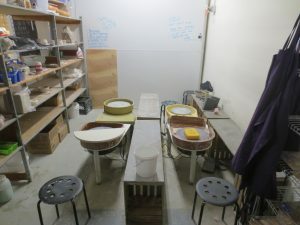 LowellMakes also has a few individual spaces, but not as widespread as Artisan’s Asylum (which is a bit different, in that it has more individual spaces than most). 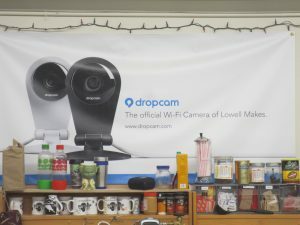 Dropcam is also the official Wi-Fi Camera of LowellMakes. 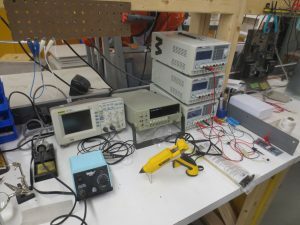 It may seem a bit silly, but maker spaces are the perfect places for companies to test drive and allow these new fangled devices to be checked out by some pretty sharp minds. There’s a high probability they will try to take it apart and see how it ticks, of course. It was good talking with these folks. We spoke about some of the common issues we all face; safety, security, outreach, working with the local city, teaching, funding. 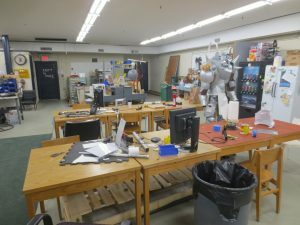 In spite of all the glitches, and some of the humorous posts on the topic, running a hacker (or maker) space takes a lot of effort and soft social skills. It isn’t easy, but we all love it.